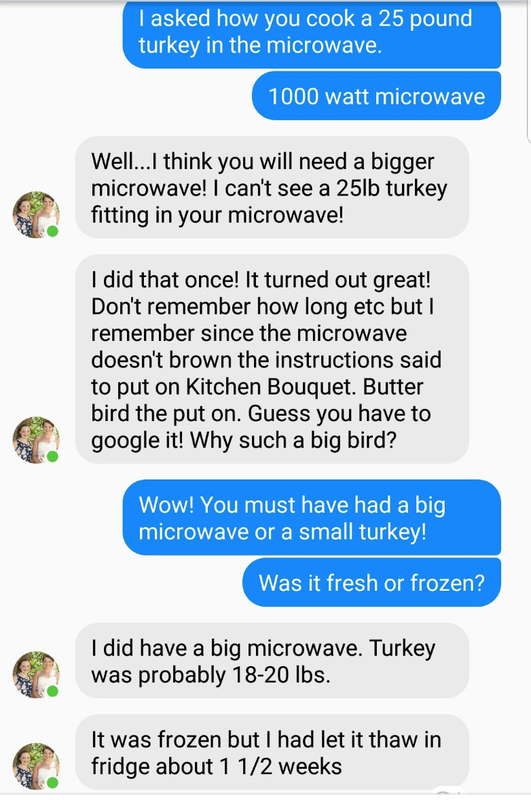 Can you think of a better time than Thanksgiving to relentlessly troll members of your family? With all the stress of the impending holiday, people on Twitter have decided to blow off steam by pranking their parents in the most absurd way. 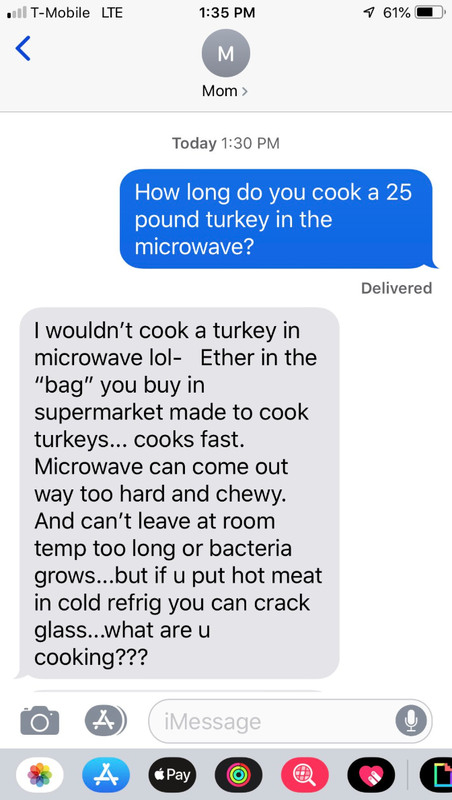 A recent meme has adult children shocking moms as they demand to know how to prepare a large turkey, presumably under the guise of a Friendsgiving celebration. The prank has parents worried for their kids' health, IQs, and future abilities to find spouses. 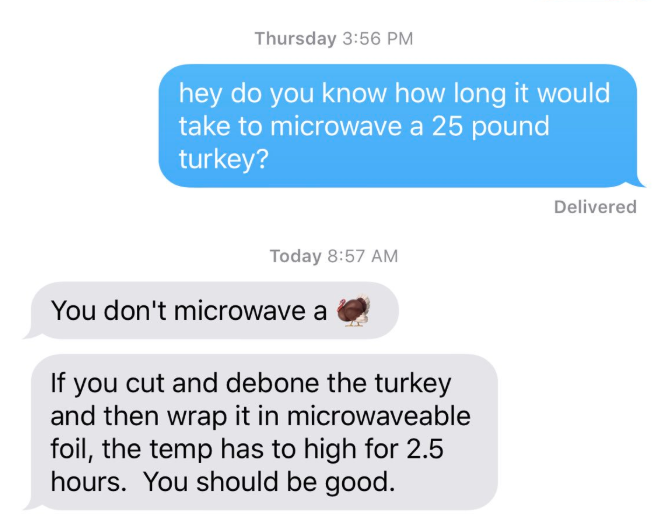 The meme began a few days ago, when someone on Twitter dared others to text their mothers and ask them how to go about nuking a 25-pound (11 kg) turkey. Anyone who knows how fun it is to pretend they're crucially ill-prepared for the real world jumped on the opportunity to expose their parents' astonishment with great delight. 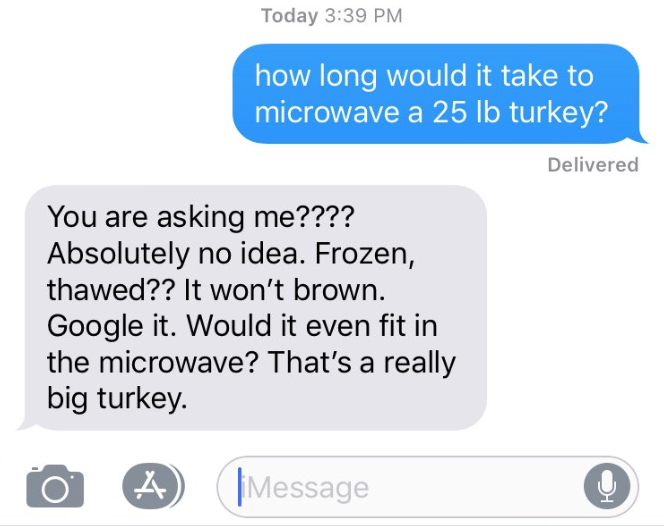 Before long, hundreds of people on Twitter were texting and calling their moms to pose this insane question, and the results were nothing short of absolutely priceless. 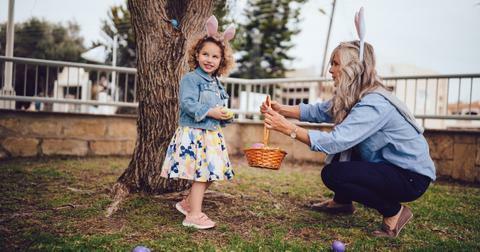 Some parents were so taken aback by the question, they didn't even think to question the life-long vegetarianism of their children, as exemplified by one person whose mom didn't even bother to ask why she'd be preparing poultry in the first place. 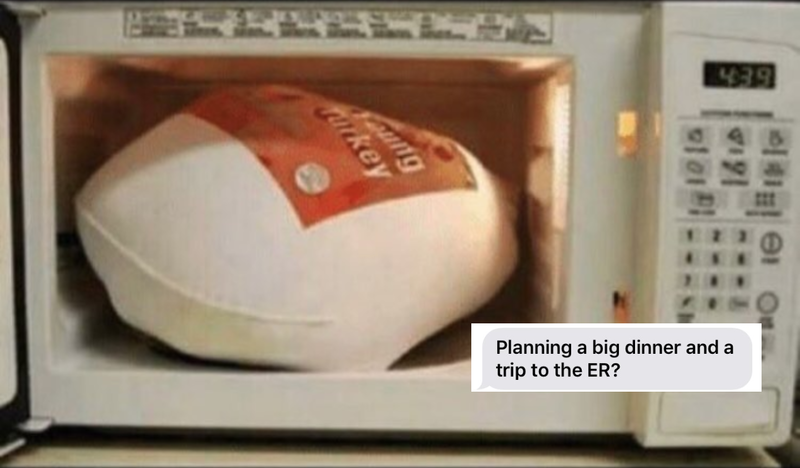 Other parents were more patient, like Lauren's, who told her plain and simply that the microwave would not deliver the turkey results she'd be looking for — but gave her the instructions to cook it safely that way, anyway. 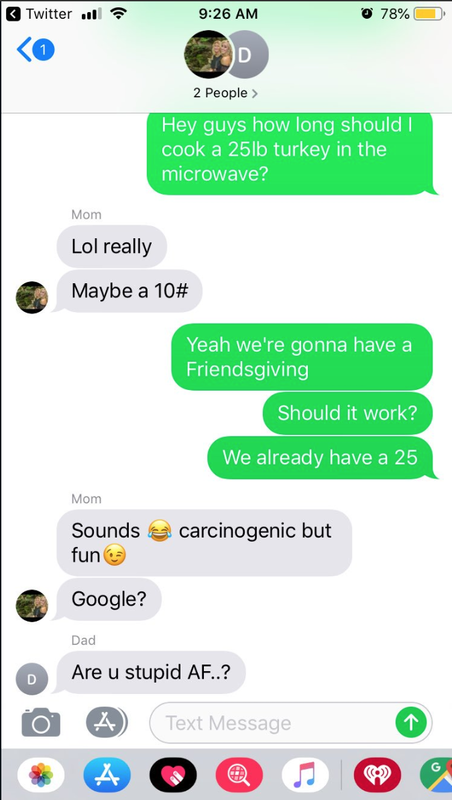 Another mother was quite indulgent of the idea, saying her kid's turkey plan sounded "carcinogenic but fun," while the father shook his head in the background. If this meme doesn't sum up family holiday dysfunction in a nutshell, I'm not sure what does. 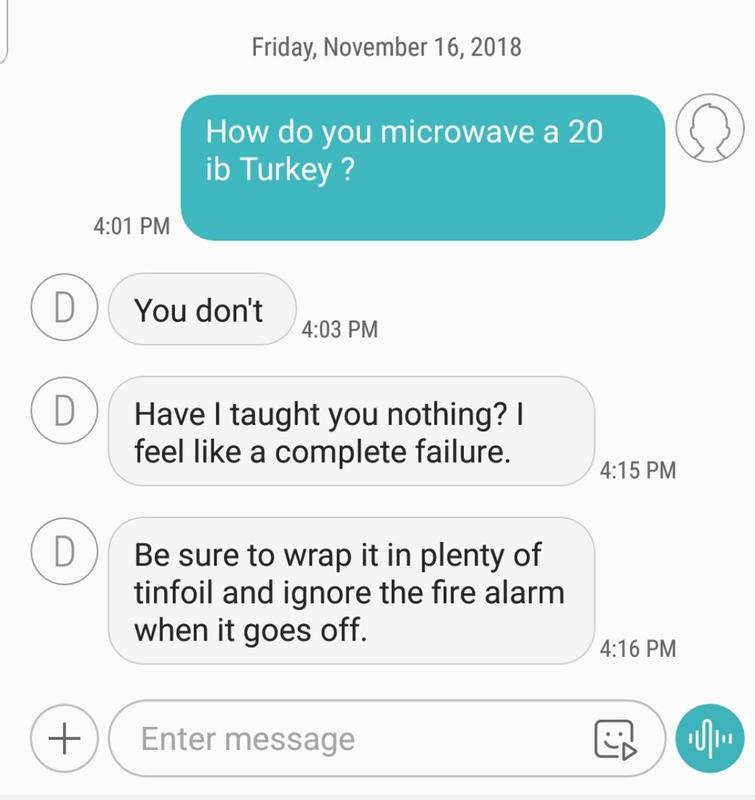 If anything, I'm pretty sure this prank serves to reveal that dads do the majority of turkey preparing on Thanksgiving day. 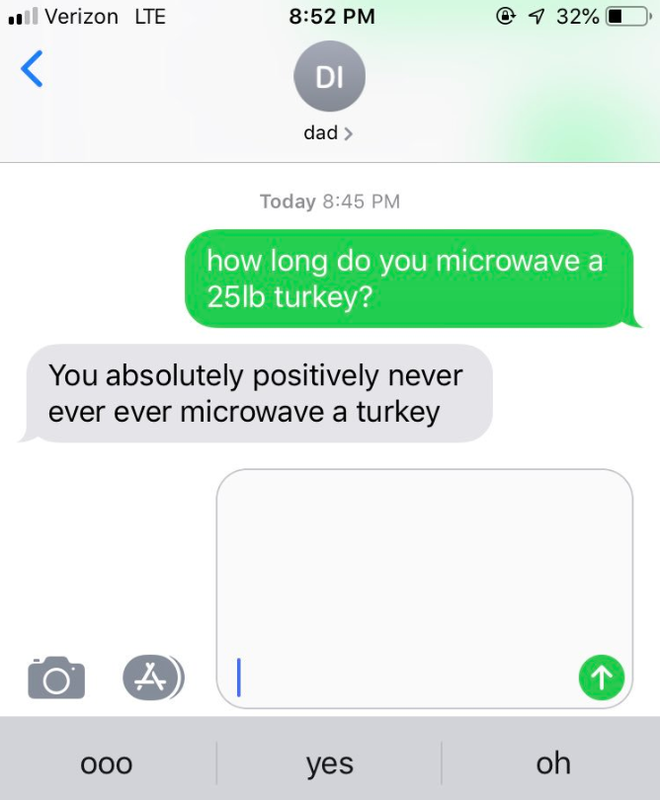 And compare it with this dad's vehement warning to "absolutely positively never ever ever" microwave a turkey. 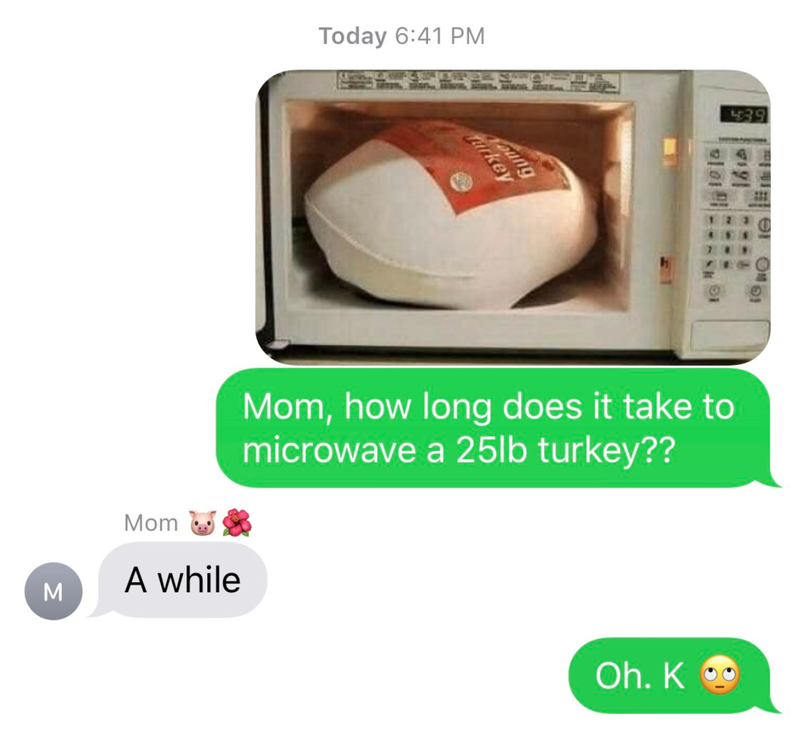 I wonder if any of these moms has actually considered preparing a turkey in the microwave before. Seems at least one might. 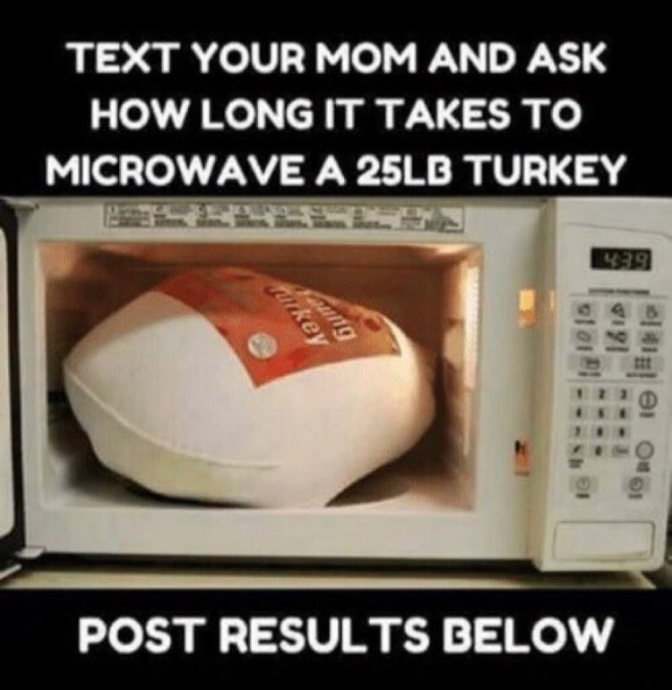 "Everyone doing that text your mom and ask how long it'd take to cook a turkey in the microwave challenge. 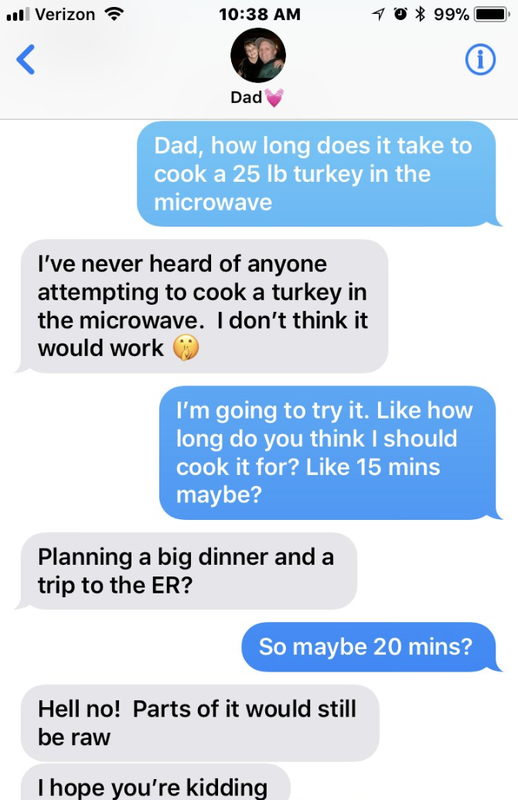 Funny thing is my mom is the least domesticated person on earth and would probably be the one to try and cook a turkey in a microwave...#TurkeyChallenge" writes Marissa on Twitter. 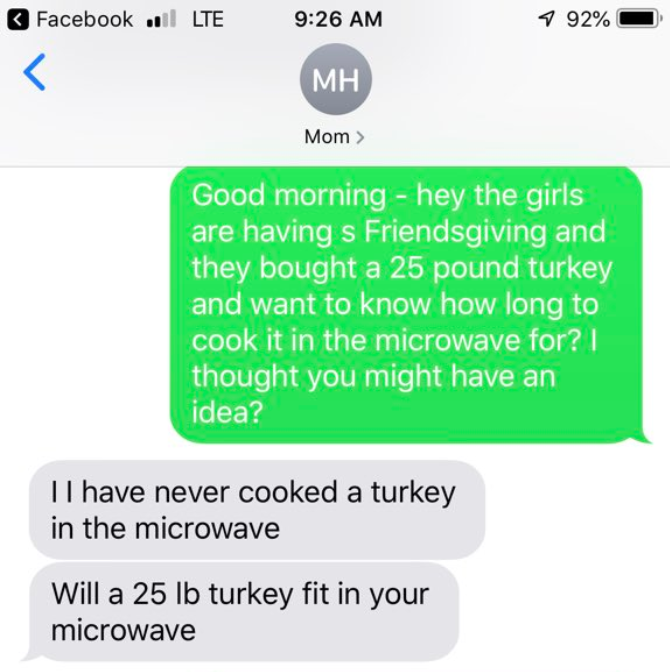 Some of these other moms have us wondering whether they're in on the prank and are just straight up trolling back, like one who revealed "there was a segment on the Today Show this morning joking about kids asking how to microwave a turkey." Jig's up, kids. Or perhaps we should be really concerned about our moms' Thanksgiving preparations. 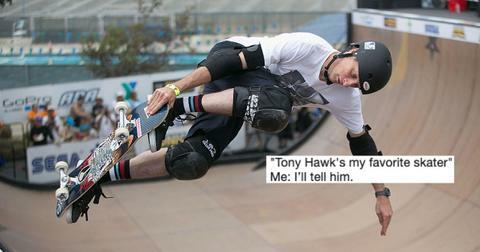 Dads, on the other hand, fear they might have failed entirely at parenting. They're urging their kids to just get take-out, rotisserie chicken, pre-prepared turkey or delivery pizza instead. Anything to avoid the microwave disaster. 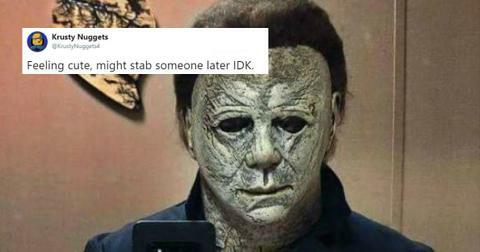 For as long as parents bring kids into the world, their kids will troll them right back. That's a Thanksgiving promise.